Comicon is coming to Phoenix this week. Have you ever heard of Comicon? It’s actually a conference that started in 1970 in San Diego. Now, not only is it in San Diego, but there is also one in Phoenix (and other major cities) every year. It is a chance to embrace your inner geek and celebrate your favorite comic book heroes. Comic book fans from all over the world get dressed up as their favorite characters and come for private screenings, for workshops, to meet their favorite comic book illustrators, writers and yes…there are always real life comic book superheroes you can meet! This week was also my parents’ Golden Wedding Anniversary. In tribute of their 50 years of devotion to one another, my brothers and I planned a special celebration to mark this milestone that only 5% of couples ever reach. As a Phoenix divorce attorney, it was nice to refocus my energy, even if just for a weekend, to reflect upon two people who never gave up so their marriage could last. In thinking about what I was going to say during my portion of the sibling toast, I started thinking about Comicon. Although it may not seem like a Golden Wedding Anniversary has anything to do with Comicon…it really does!! 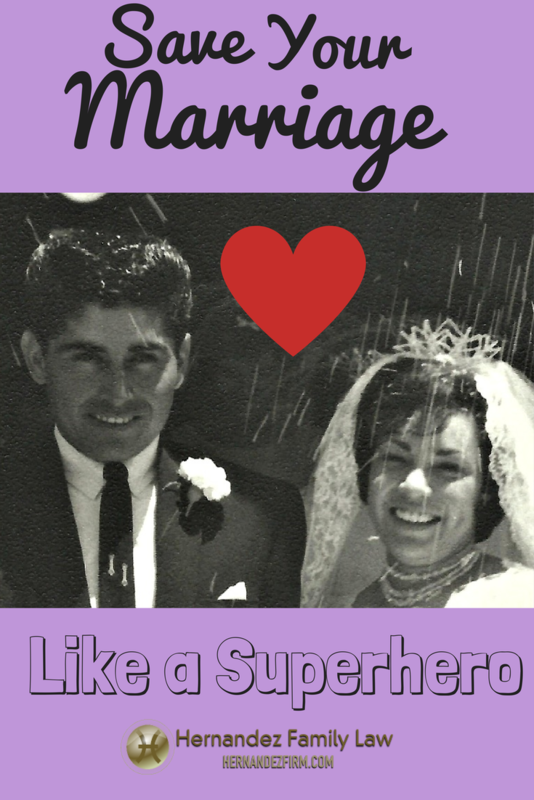 My brothers and I were amazingly lucky to live every single day of our childhood with two real-life superheroes, and today, I’m going to share a few important secrets about how to save your marriage like a superhero. My Dad is as tough as nails. He is also half man/half billy goat. Really! The guy can walk, hike and climb for miles without showing any sign or symptom of fatigue. I’ve seen him scale rooftops and on the very top rungs of ladders, always keeping his equilibrium, composure and a straight face. Dad has personally led me by the hand across the world’s most treacherous cliffs in the biggest hole in the ground without flinching or breaking a sweat. Dad is also a genius mathmetician and a mad scientist in disguise. Going through some of the hardest chemistry, biology and calculus classes, we would go to Dad when we were stumped, and he could always solve the problem. For me though, the best thing about my Dad is the fact that the guy has a tool for everything and can fix anything… cars….curling irons…and broken hearts. Growing up, no matter what the problem was, if there was something that needed to be solved or fixed, Dad could and would do it. My Mom didn’t have an invisible plane or magic rope like Wonder Woman, but she can read minds, is a master of illusion, is a champion juggler and is a healer. She made being a wife and mother look easy. (PS – It’s not.) It didn’t matter what Halloween costume or prom dress any of us kids wanted, she waved a wand, wiggled her nose, put her foot to the pedal and in some cases, overnight, she had manifested an elaborate creation out of thin air and a closet full of scraps. Mom was the nurturer in our family, and she taught us the healing power of love by expressing hers with tons of hugs and kisses every day. Mom was always in tune with how all of us kids were feeling. There were times when I was thousands of miles away at college having a meltdown, and my phone would ring. It was Mom, asking “Are you OK?” and when I wasn’t, she talked me off the ledge. Together, my Mom and Dad encouraged us kids to realize the wholeness of who we truly are. When we didn’t believe in ourselves, they always did. They knew when we needed straightening out, when we needed protection, and also when we just needed them to hold us and tell us that we were loved. So… getting back to comic book superheroes… you know that all of them have flashes of mortality. The same goes for my Mom and Dad. To make my point about how you can save your marriage like a superhero, today I will tell a story my Mom shared with me a long time ago that is perfect for this special occasion. It was May of 1964, just days before Mom and Dad were to get married. Everyone was scurrying around, getting those last minute details ready. In a rare break from all of this hustle and bustle, my Mom and Dad were able to steal a few minutes alone together. As they were sitting on the front porch step talking about the big event that was about to happen, my Mom (remember she’s a mind reader) sensed something was bothering my Dad. When she looked in his eyes, she saw they were full of worry. When she pressed him to tell her what was wrong, my Dad wouldn’t. Mom’s heart nearly stopped beating, because she thought Dad was getting cold feet. She got panicked and was on the verge of devastation, but never being one to give up or mince words, my Mom continued to press. Finally, my Dad gave in…. Revealing his love with tears rolling down his cheek, my Dad shared his biggest and deepest fear with Mom. He told her he was afraid he wouldn’t be able to take care of her. Superheroes are always looking out for their partner. They are present to and in tune with what the other needs in any given moment. They understand that conflict in any relationship is normal and if handled the right way, it can lead to more wisdom and a stronger bond. Superheroes pick their battles wisely. They know when to let something go. They respect each other and are loyal. They understand the meaning of sacrifice, and they always adjust for the highest good of the relationship. I am proud to celebrate this milestone with my Mom and Dad. I am so thankful for the beautiful life they created for our family. It wasn’t perfect, they didn’t always get along, and sometimes my brothers and I got scared when we saw them argue. But…they worked at their marriage. Even now, after 50 years, they are still working through issues that come up (and they do). And…when the going gets tough, Mom and Dad always go back to the love that first brought them together and binds them today. My Superman and my Lois Lane. Sending you my wishes for a week in which you become the superhero you really are. P.S. I am also sharing a very special video created by my brothers and me in honor of my parents. Even if you don’t know my family, if you want to bear witness to a fairytale love story…you must watch it. Thanks to my brother, Shannon Hernandez, for producing the expertly-crafted documentary.